The Darkmoon Faire has been in game so long that even its fireworks and carnival games seem kind of dull. But as the Legion marches on, the Faire offers reputation buffs that offer a great opportunity to max out Armies of Legionfall to finish up your Broken Isles Pathfinder achievements and start flying. But if you’re already on top of those, you still need the Legionfall Commander achievement, which requires revered reputation with Armies of Legionfall. 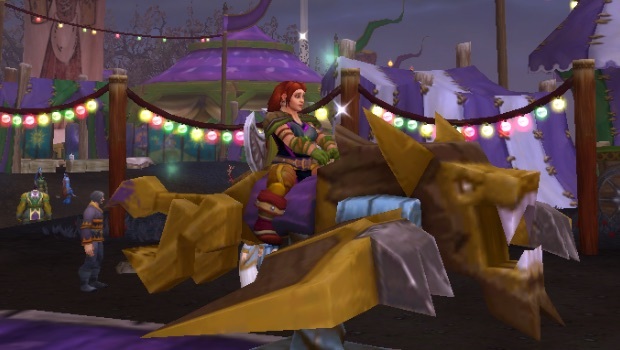 If you’re behind on the grind (like I am), Darkmoon Faire buffs can help you rack up the reputation 10% faster. So head to the Faire and pick up a Darkmoon Top Hat (a consumable that gives an hour-long buff that grants +10% reputation) or buy a ticket to ride the carousel for WHEE! (an hour-long buff that grants +10% reputation and +10% experience). Though they’ll take you a few trips to the Faire, it’s well worth speeding up the last of your reputation grind. But while the reputation boost is a great reason to visit the Faire right now, it’s not the only reason. There are mounts, pets, toys, and heirlooms to collect, plus easy profession leveling and that nice XP boost if you’re working up an alt. For a rundown of everything the Darkmoon Faire has to offer, check out Wowhead’s Darkmoon Made Easy guide.